Flattering50: Mobile Shopping: Madness or a Must? Mobile Shopping: Madness or a Must? I admit it: Mobile devices scare me. Maybe it has to do with where I live (30 miles from New York City), but it seems like more and more people are spending every spare second on their Smart phones or mobile tablets. Everywhere I turn, someone is online on the train, while waiting for her dry cleaning, while walking down the street, when eating—with other people—in a restaurant, during a movie at the cinema, while driving a car, and so on. It doesn’t seem entirely healthy—to say the least. In my world, healthy people need unoccupied time to reflect, to look at the world around them, to make connections, to engage—things like that. That’s not easy to do when you’re on a mobile device. That said, the next time you see an over 50 woman on her mobile device in a department store, it might be me. Say what? Yes, I intend to join the mobile shopping revolution. Here’s why: First of all, I read an interesting statistic about mobile shopping over Thanksgiving weekend and Cyber Monday in 2011 in Women’s Wear Daily. According to the WWD article, “more than one in three [mobile] purchases occurred while the shopper was in-store.” It makes sense—no waiting on long lines to pay or lugging packages around while you shop at other stores at the mall. And mobile shopping in stores may save money. True story: In November, I was shopping for a knee-length puffy coat. Macy’s was having a 40% off sale—how could I resist! There was a great selection, but I ended up with a style by an old favorite—Jones New York. Now, I’m not sure what possessed me, but I decided to go online when I got home to see if Macy’s online site was offering the same styles and the same great deal as its store. 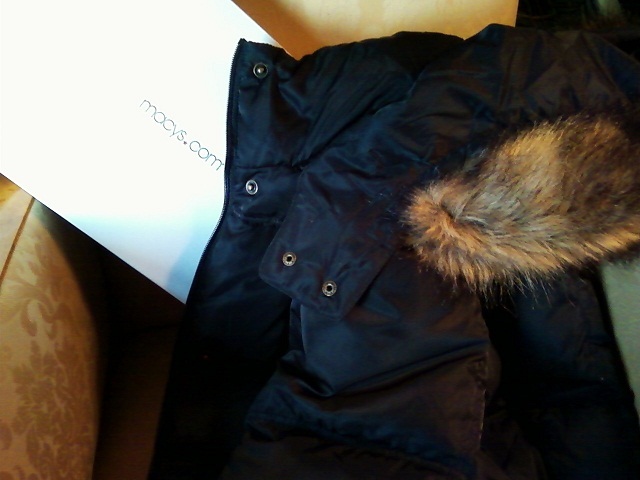 And guess what—the exact Jones New York puffy coat was $30 less at Macy’s online. My word! Of course, the smart shopper would have turned right around and returned the store-bought coat and ordered the online version. However, the Macy’s store wasn’t around the corner for me and, well, I just didn’t. The point is, if I had consulted a mobile device while I was in Macy's, I could have conveniently compared in-store and online prices and saved $30. Finally, today, I was relaying all this info to my digital guru, my eldest son, and he told me about a shopping app he uses. Apparently, with this shopping app, you can scan the bar code of a product while you’re in the store and your mobile device will find the same product at other stores in your area. You can then find out where the best price for the product is in your area. Amazing! January is always a month of fabulous end-of-season sales in stores. I don’t own a Smart Phone (I’m always the last to upgrade), but my husband has an iPad. I don’t plan to leave home without it. Do you mobile shop while you’re in stores? What have you learned about it? I’d love to hear your experiences. Give Away: What’s Your 2012 Fashion Resolution?